Presbyopia, is also known as the "short arm syndrome", is a term used to describe an eye in which the natural lens can no longer accommodate. Accommodation is the eye's way of changing its focusing distance: the lens thickens, increasing its ability to focus close-up. From the day we are born, our ability to focus up close starts to diminish. Presbyopia is a natural part of aging and affects everyone eventually. As the eye ages, the elasticity of the lens decreases and the lens itself may thicken. The ciliary muscles that hold the lens in place also decrease in elasticity. These changes are believed to cause trouble with near vision. Presbyopia will affect everyone, but usually not until age 40. At that point, the eyes’ ability to focus decreases gradually. Even if the patient has never had any vision problems previously, they will develop presbyopia. Nearsighted people also develop presbyopia, even though they are used to having good near vision. A nearsighted person may find they need to hold a newspaper or tablet at arm’s length to see it, just like any other person developing presbyopia. Another symptom of presbyopia is eye strain when performing close work, such as typing. Bifocals are the common treatment for presbyopia. Bifocal lenses have two points of focus, one for distance and one for near vision. The distance vision portion takes up the main part of the lens, with the near vision portion at the bottom in a little box. 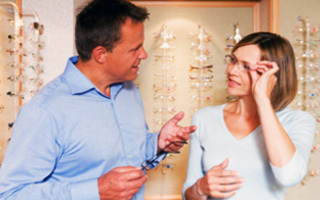 Progressive addition lenses are another kind of lens that can be used for presbyopia. They are similar to bifocals, with more of a gradual transition between the two points of focus. Multifocal contact lenses can also be prescribed. Reading glasses can also be worn for presbyopia and are normally only worn for close work. If the patient already uses contact lenses, the doctor can prescribe reading glasses that can be combined with their contacts. It is possible to develop presbyopia before age forty. Early development of presbyopia is known as premature presbyopia. Farsightedness and some diseases such as diabetes and muscular sclerosis are risk factors for premature presbyopia. In addition, some prescription drugs like antidepressants and antihistamines can inhibit the eyes’ ability to focus. Reading glasses, bifocals or progressive lenses. Some people are concerned that wearing reading glasses will weaken the eyes. Because the process is continuous, our need for reading glasses will increase whether we wear them or not and whether we like it or not. The reading glasses do not weaken our eyes. • Conductive keratoplasty: A non-laser refractive surgery that reshapes the cornea using low-level radio frequency energy. The tissue at the site of the application shrinks and tightens the cornea, changing the curvature and producing clear near vision. The correction is temporary, and will diminish over time. • Laser eye surgery: A surgical procedure where vision is corrected by removing a small part of the eye with a laser. Using a highly focused laser beam, a specialist cuts away a bit of eye tissue, flattening the cornea and correcting the focus. 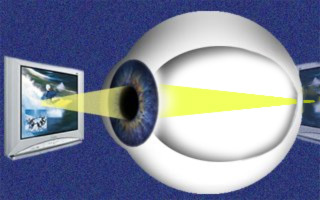 Patients with presbyopia undergoing laser eye surgery can be given monovision, a method where one eye is corrected for near vision and one eye is corrected for far vision. • Refractive lens replacement surgery: A surgical procedure where the natural lens of the eye is removed and replaced with an artificial lens. This allows vision to be corrected at all distances. A diagnosis of presbyopia can be made during the course of a comprehensive eye exam. 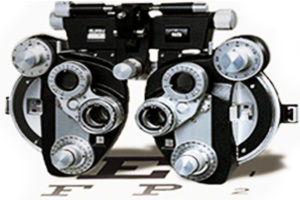 A machine called a phoropter allows the doctor to show a series of lenses to a patient, switching back and forth between them to determine the best fit for corrective lenses. Reading glasses are a common solution for mild presbyopia. You can purchase reading glasses at drug store, but they are only temporarily effective because the lenses are not your prescription and over time that may do more harm than good. Because the lens of the eye is slowly changing over time, periodic examinations are needed to update corrective lenses. Since it is a natural part of the aging process and not a disease, there are no preventative measures for presbyopia. Maintaining overall health as a means to eye health is always recommended. Fruits and vegetables high in vitamins A, C and E are key foods for eye health. Taking frequent breaks while doing close work allows the ocular muscles to unwind. Try looking off into the distance every ten minutes or so to keep your eyes relaxed. Wearing sunglasses to prevent UV damage to the eyes helps keep vision sharp later in life. If you are over forty and developing headaches after doing close work, such as sewing, or experiencing eye strain after reading, see your optometrist or ophthalmologist for a checkup.